Every week it seems there’s always some stragglers that don’t follow the crowd of scheduled Thursday (Wednesday night) new releases. But just because these games march to the beat of their own release schedule doesn’t mean they’re not worth taking note of. This week, here’s a rundown of several titles that slipped under the radar. It’s pretty sequel-heavy, actually, but there are some gems that are worth taking the time to check out. SHAARK!+, $1.99 – [Forum Thread] – Developer Rusty Moyher won my heart with Box Cat ($1.99) and proved he had a knack for making simple and fun pixely games. Angle Isle is his latest, and it’s pretty interesting. 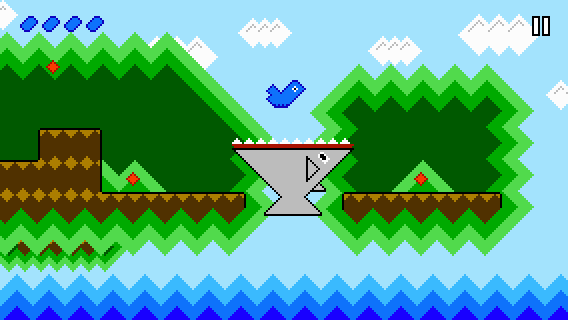 It’s sort of a platformer where you have a limited number of “flaps" to make it to each platform and collect enough items to move on to the next section. It’s unique and challenging, and I really dig the whole 45-degree angle based visuals thing. Danmaku Unlimited 2 - Bullet Hell Shmup, $4.99 / Lite – [Forum Thread] – The original Danmaku Unlimited was one of the finest bullet-hell shooters on the App Store that didn’t have “Cave" in its developer title. The sequel seems to have made a splash with our community already, and has actually surpassed Cave’s offerings with features that I want like iPhone 5 widescreen support and true Retina Display visuals. If you like shooters, at least give the lite version a spin, you won’t be disappointed. Infect Them All 2 : Zombies, $0.99 – [Forum Thread] – The original Infect Them All launched way back in June of 2010, and developed quite a decent following. This new version keeps things pretty similar to the first, tasking you with running around and infecting humans to turn them all into zombies, but also adds a few welcome new features as well as Universal iPad support, Retina Display visuals, and widescreen support for the iPhone 5. If you’re curious, check out the lite version of the original and if you dig it, you should be all over this enhanced sequel. SpikeDislike2, $0.99 – [Forum Thread] – Continuing on with the theme of sequels, developer James Gamble has released a new and improved version of his devilish arcade game SpikeDislike. You may recall that I was borderline obsessed with the original SpikeDislike, and I’d often dreamed about an enhanced version with widescreen support. That’s exactly what SpikeDislike 2 brings, as it’s been completely rewritten from the ground up and runs smooth as silk. It also takes the idea of different themes from the original but actually adds in new features to each, making each theme an actual different gameplay experience rather than just a different visual skin.